The Olympics are fun. They’re a time when we can sit at a TV, pretending we like other humans as well as our country, all while cheering for athletes whose names we learned 10 minutes ago on Google. 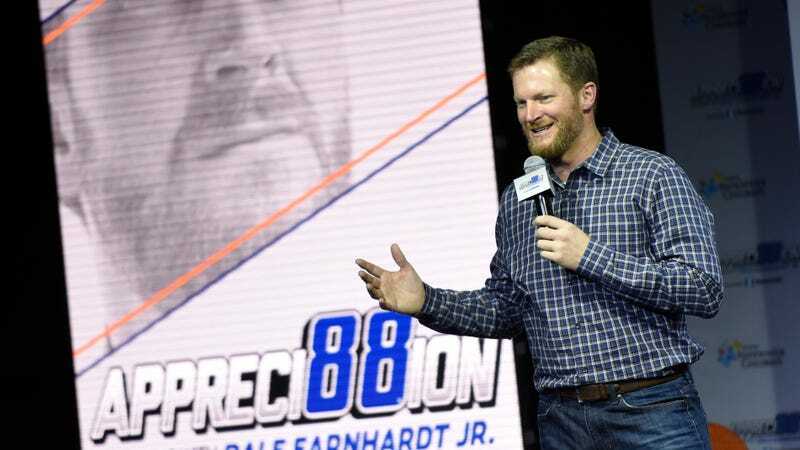 The Olympics will be even more fun when Dale Earnhardt Jr. runs around with a microphone on the broadcast. NASCAR’s favorite son retired from the top Monster Energy NASCAR Cup Series at the end of the 2017 season. Earnhardt, a guy with an old western town and a car graveyard on his property, planned to have a home-renovation show and commentate on NASCAR races for NBC Sports in his retirement. But his time on camera will start sooner than the Daytona 500, because Earnhardt will be on the broadcast crew for the Super Bowl and the Winter Olympics in South Korea. While the Summer Olympics are objectively the best Olympics because they have rhythmic gymnastics, the best Olympics event, putting Earnhardt on the broadcast makes all of that snow and ice a little more appealing. The most random combinations can sometimes make for the best ones, after all. Of course, Earnhardt won’t get to do anything that’s super out of his element, like talk about ski jumping or figure skating. He’ll go around Pyeongchang and learn about culture, on top of watching the Olympic competitions. An NBC announcement did say he’d get to go try out an Olympic bobsled, though, which sounds entertaining enough. Bobsleds, home renovation and the Olympic Games. That makes for just about the most random mix of retirement activities an incredibly famous NASCAR driver could pick, but that’s kind of the beauty of it.